Today’s forex analysis for the euro vs dollar pair is limited to say the least since the trading session comprised of a lacklustre move in a very tight range with the open and close of the trading session being virtually identical and once again failing to breach the USD1.43 price level which continues to present a barrier to any move higher. The only significant aspect of today’s trading appeared to be the 14 day moving which also seemed to prevent a further rise in the Euro. 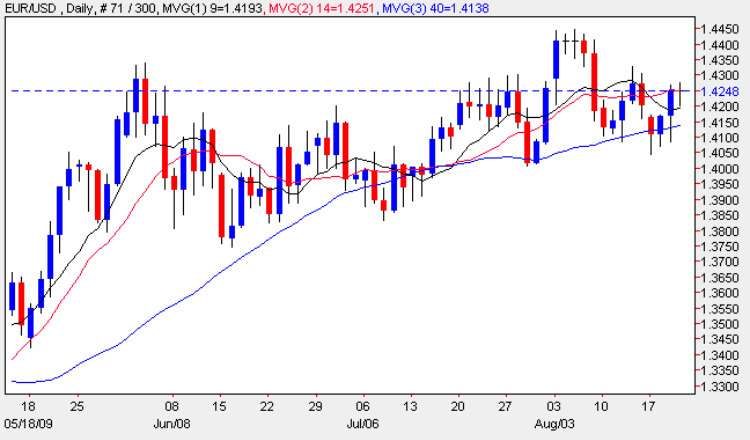 Technically the pair are once again balanced in a delicate position on the forex chart as we wait for a sustained breakout (or fakeout) to confirm any further upward move or alternatively a retreat from the current level as we fail at the USD1.43 level once again. Given the series of higher lows outlined in yesterday’s forex market analysis it would be no surprise to see this level breached in the next few days, but with Friday now ahead and the annual central bankers jolly in Jackson Hole the markets are now waiting expectantly for some definitive fundamental news. However, we may see a degree of price activity tomorrow morning following a flurry of economic releases for the Eurozone. Items of fundamental news on the economic calendar for the Euro kicks off with French Flash Manufacturing/Services PMI data which are expected to come in better than the last time with the former forecast at 49.1 and the latter at 46.6 both edging towards the magic number 50 which indicates an economy in expansion. This is followed shortly after by the German equivalent which are expected to show a similar trend of gradual improvement with the former forecast at 47.1 and the latter at 48.8. Finally to complete this clutch of data we have the equivalent numbers for the Eurozone as a whole and here too the numbers are 47.8 and 46.6 respectively. Meanwhile in the US we have one item of news and one speech, the former being Existing Home Sales which are forecast to show a slight improvement from last time at 5.03m against a previous of 4.89m. Finally to round off the week we have a speech from Fed Chairman Ben Bernanke who is delivery a talk appropriately entitled “Reflections on a Year of Crisis” (unless of course you happen to be Goldman Sach – or as they are now affectionately known Goldman Squid!! ).